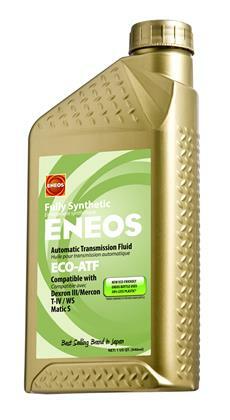 ENEOS ECO-ATF is a fuel efficient, low viscosity automatic transmission fluid that meets many of the ATF needs for Toyota, Honda, Nissan, Mitsubishi, Hyundai/Kia, GM and Ford vehicles today. 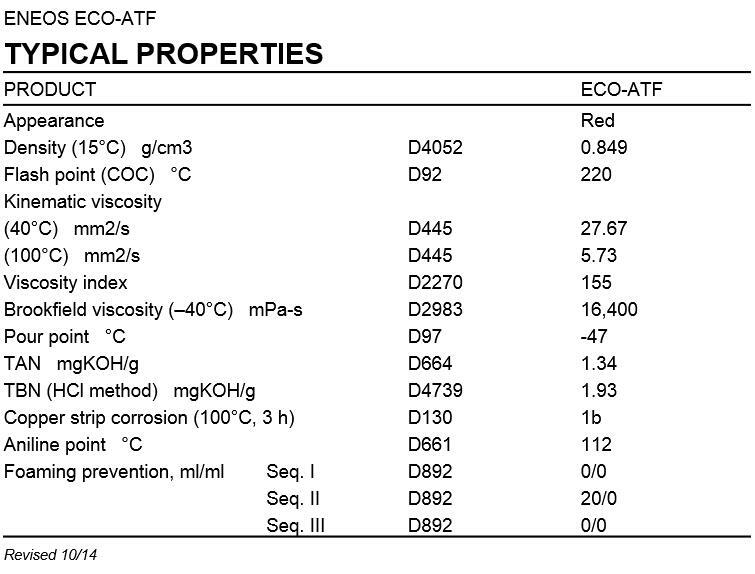 ENEOS ECO-ATF contains premium base stocks and a low-molecular weight VI improver. The base oil provides improved oxidative and thermal stability. The additive chemistry provides high resistance to mechanical shear and fatigue. ENEOS ECO-ATF was developed using technology to improve fuel economy in automatic transmissions. Using ENEOS ECO-ATF will help to reduce energy loss from oil churning in the torque converter and reduce drag resistance in the shift clutch without compromising fatigue prevention or anti-wear performance. ENEOS ECO-ATF meets the latest General Motors DEXRON®-III and Ford MERCON® standards. 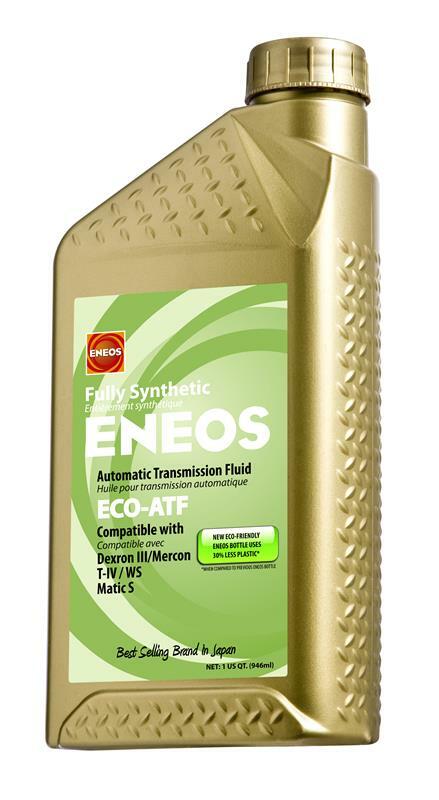 ENEOS ECO-ATF is a multipurpose ATF that can be used in both regular automatic transmissions and in the increasingly popular transmissions that have slip-lockup control systems. Thanks to its well-balanced blend of carefully selected additives, ENEOS ECO-ATF has outstanding friction characteristics with wet clutches and brakes (characteristics that affect the shifting performance of automatic transmissions). As a result, gear shifting is smoother with less shock. The fluid also has superb, long-lasting antishudder protection. The friction modifiers and other additives in ENEOS ECO-ATF have been carefully screened for top-level compatibility with the rubber, nylon, and plastic materials used in the components of automatic transmissions. The well-balanced blend of high-performance base oils and carefully selected additives used in ENEOS ECHO-ATF ensure superior performance in every area required of ATFs, including low-temperature flow properties, oxidation stability, antiwear, shear stability, and foaming prevention. ENEOS ECO-ATF is compatible with ALL Japanese vehicles equipped with torque converter automatic transmissions (excluding CVTs). This includes conventional 4-speed slip-lock-up ATs, 5- and 6-speed automatic transmissions. ENEOS ECO-ATF is compatible with all types of rubber, nylon and resin materials used for mechanical parts (seals, gaskets, friction materials, etc.) typically found in automatic transmissions.